I read an interesting article the other day that stated that mowing the grass can help to relieve stress and boost your memory. 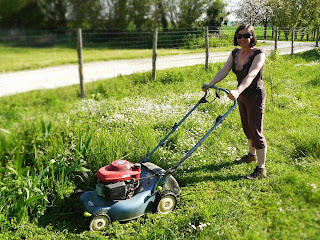 Before we moved to France and indeed for the first few years we were here, mowing was a ‘blue’ chore chez nous, unlike washing and ironing which were and still are ‘pink’ chores. This meant I had little or no experience or interest in it, although I do remember it used to be my Monday evening summer task at home when I was not much older than Ed. With Ade working away, keeping the grass (well green growing stuff, to be more accurate) in the front and back courtyards neat and tidy is something I have taken on, look forward to and really enjoy doing. Having left a stoney courtyard to 'grow' we have ended up with a clover lawn that the bees love almost as much as we do. It is therefore no surprise to me that researchers have discovered it is good for you due to the happy and relaxed feelings a chemical released by a mown lawn gives you. It also appears to be able to prevent mental decline in old age as these happy, relaxed feelings combat bad stress that over time can damage the hippocampus leading to increased blood pressure, forgetfulness and a weakening of the immune system. I love my time spent mowing, I’m out in the fresh air, more often then not the sun is shining, I’m getting exercise and my mind is relaxed and often wanders away with itself. A bit like dog walking, I don’t find it a chore at all. For me the walking mower will always win over the ride on mower that Ade loves. One of the things that was on his wish list when we moved to France was a garden big enough for a ride on mower and our orchard is certainly that. 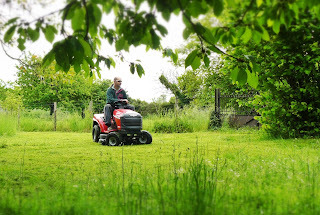 Shortly after moving in he found a jolly red mower that fitted the bill – it needed to be under a metre wide in order to get through the orchard gate, and not be too expensive. The only way to get it home was to hire the knackered old van the shop kept for such occasions, leave his Mum, Ed and I loitering in the car park while he and his Dad made the 90km trip home and back – kerching! (That added a bit to the price). Not long after we got it, whilst making a tricky manoeuvre he clunked it into something and broke the steering rod – kerching! That cost a bit to replace, but at least he had the knowledge to be able to fix it. After a few years we struck another problem, the gearbox went. We spoke to a local company specialising in mowers and were quoted well over half the original purchase price to replace the gearbox – kerching! It was at this point Ade wondered whether to bother or not. There is no need to mow over winter and once the weather warms up the grass goes yellow and doesn’t need mowing, plus the ducks and goose do a bit of grazing for us. Some years it doesn’t get much use at all, especially if I am doing most of the mowing. He doesn’t mind me using it, but I’ll admit I’m not spatially aware enough to guide it safely between the concrete gateposts – clearance is about an inch either side. But we all know boys need their toys and being Mr Resourceful he found replacements for the shattered gears and selectors and carried out the delicate surgery required to fix it yet again. Add to this the odd flat tyre and replacement drive belt over the years and it probably works out more expensive to keep than Ed! But at least those feel good chemicals balance out the stress of keeping his toy running and let’s be honest, who wouldn’t want a shiny red tractor of their own? I love my push mower. Ride-ons seem more hassle than they're worth. It's hard work this year though, what with it being too wet. Maybe I'll start a water meadow? We are lucky not to get waterlogged, but all the rain has made the grass grow like mad. While you can never put a price on your health, by far the highest price you will pay is when it is compromised! Desires for society concerning wellbeing at work have additionally changed, with expanding requests for better benchmarks of assurance at work and for the improvement of the nature of working life.